When Niko Rauhala and Janne Juutinen decided to form a band in the spring of 2002, they had to think of a good name for a band that would have surprising and clever songs. After some brainstorming they came up with a name that seemed to fit them perfectly: MASTERSTROKE. At first there were four members in the band: Niko Rauhala – vocals & guitar, Janne Juutinen – drums, Mikko Viheriälä (ex-Dreamtale) – keyboard, and Arto Tissari (Korpiklaani, Crystalic) – bass. Masterstroke made a demo CD and some gigs with this line-up. In 2003 another guitarist, Markus Kekoni. joined the band. At the end of the year Masterstroke also got a new singer, Jari Tiura (Snakegod, Michael Schenker Group). 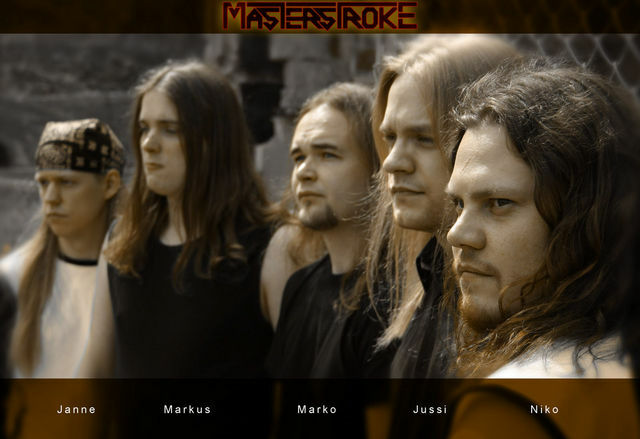 In 2004 Masterstroke went to the studio to record a demo with the new line-up. However, there were more changes to come: Mikko decided to leave the band, and he was replaced by Jussi Kulomaa. The band had several gigs in 2004, and it turned out that Jari Tiura was unable to concentrate fully on Masterstroke. It was time to remodify the line-up, and soon Niko was back behind the microphone. By 2005 Masterstroke had had enough of recording demo CDs. The band went to the studio again, but this time a full-length album was recorded instead. Arto Tissari plays the bass on the album, but after the recordings he chose to concentrate on the other bands he plays in. The new bass player was Marko Kolehmainen, and the album was titled Apocalypse. Later in the same year Masterstroke signed a deal with the Finnish label JMT-Music.